To many pet owners, the loss of a four legged companion takes on the same importance as the loss of a family member. 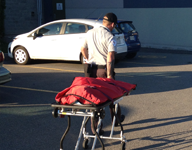 Regardless of the size of your pet; in the event they should pass away K-911’s Pet Decease Removal service will gently remove them with the utmost dignity and respect they deserve. 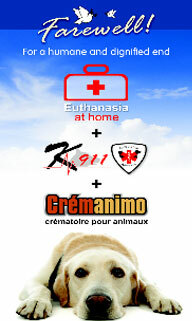 K-911 can offer you their group cremations or a private cremation day or night as they have now teamed up with Crémanimo. If you desire a commemorative service, ask K-911 for your options. Some may not understand the profound sense of loss that one feels when their pet dies, but here at K-911 we truly understand as we too have experienced the loss of own four-legged companions. We are there for you and your pet, from emergency care to the afterlife. With one phone call, all your pet's needs will be taken care of 24/7. You will never be alone in the event your pet passes away day or night. What options do I have for my pet’s aftercare? 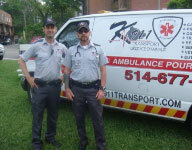 K-911 directly for your entire pet’s after care needs. In some cases we lose our loved ones too early and we need answers as to why and how this could have happened so we can have closure and start the grieving process, in this case you should contact your vet and request a necropsy performed which will render you the results you need to put your mind at ease. 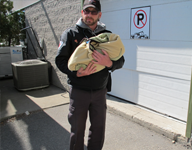 K-911 will be there to help transport your pet to the proper facilities 24/7. Transportation to your pet’s veterinary. please make a donation on behalf of your pet or in memory of your pet in helping us provide veterinarian care for homeless animals including the injured and sick wildlife.